The purpose of this turorial is to demonstrate an innovative approach for low cost continuous liquid level monitoring based on MPX5010DP differential pressure sensor. Most of the traditional measuring systems were designed and implemented by complicated hardware circuitry. It made the product expensive, with low functionality and with limited precision. With virtual measurement technology, more of the instrument can be substituted by software. Using this approach the cheaper and more versatile measurement system can be developed. The method for obtaining liquid level with one differential pressure sensors MPX5010DP is suggested and considered. Some basic considerations about the modern integrated pressure sensors and some aspects concerning their capability for liquid level measurement are done. 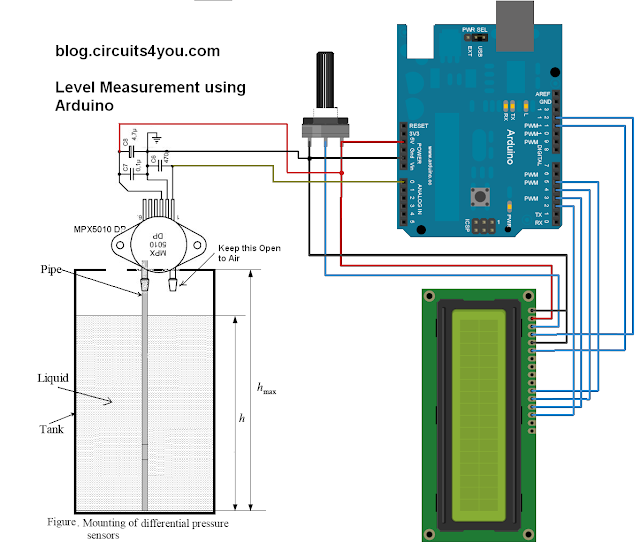 Finally, a prototype of a liquid level monitoring system based on integrated differential pressure sensors, arduino board and LabVIEW environment is developed for measuring liquid level accurately at distances up to 10 metres. In order to illustrate flexibility of the designed system the front panel of the developed virtual instrument is presented. Measurements carried out in laboratory show that the accuracy of some millimetres could be achieved. pressure, and is measured relative to vacuum. Differential pressure is the difference between two pressures. Gage pressure is a form of differential pressure measurement in which atmospheric pressure is used as the reference. A pressure transmitter can be used to determine the liquid level in a tank, well, river or other body of liquid. 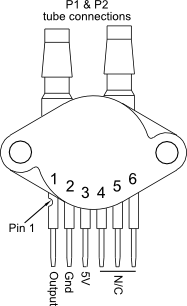 If a pipe is placed vertically, with one end dipped into a liquid and the upper end of the pipe is closed off and some air volume is trapped. 1. Put the pipe in water as you dip it in water you will see the level of water. 2. The principle of operation is when liquid level rises the trapped air in pipe generates pressure on sensor that is proportional to the liquid level. 3. Take care of proper sealing at the joint of sensor and pipe. 4. You can use water purifier pipe.